Roger Denton has 25+ years of martial arts experience. He teaches Brazilian Jiu-Jitsu and Mixed Martial Arts, and coaches/manages professional and amateur MMA fighters. Roger began his martial arts career with Tang Soo Do, a Korean form of Karate. He later began studying Jun Fan/Jeet Kune Do, which was developed by Bruce Lee and Dan Inosanto. He received Jun Fan/Jeet Kune Do/Filipino Martial Arts Certification from Paul Vunak (Progressive Fighting Systems) in 1994. He relocated to Arizona to further his martial arts practice, and received additional Jeet Kune Do Certification from Sharam Moosavi (Jeet Kune Do International). Roger began studying Brazilian Jiu-Jitsu in 1991 and was promoted to Black Belt in 2007. He was Fabio Araujo’s first BJJ Black Belt in the United States. 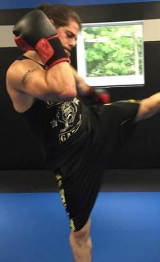 In addition to Brazilian Jiu-Jitsu and Jun Fan/Jeet Kune Do, Roger also studies and teaches Western boxing, Muay Thai, Panantukan (Filipino boxing), Filipino Weapons and Stickfighting, and Savate (French kickboxing). Roger holds a 3rd Degree Black Belt in Brazilian Jiu Jitsu as of May 2015. C3 Athletics/Stamford Fight Club is proud to have Danny “Joey” Valle as our Boxing coach. Danny, a Bronx native, come from a long line of Boxing trainers. Both his father and grandfather have either trained directly or helped train multiple World Champions. As an amateur Boxer, Joey was undefeated and a Golden Gloves Champion, scoring the fastest knock in the Golden Gloves at 6 seconds! As a pro, Joey is undefeated as well, with almost all of his wins coming by way of knockout. Joey will be leading the process to produce the next crop of fighters here at C3. Joey is an expert in taking the ordinary person that is interested in Boxing and creating a safe, enjoyable environment to learn the fundamentals of the sport. He introduces his students to “The Sweet Science” by building a good, solid foundation before expanding on their knowledge of the art. His students stand as a direct reflection of the professional-grade training they receive personally from Joey. Outside of training adults, Joey runs an excellent kid’s Boxing program and instills the values he learned from Boxing at a young age. These same values have carried him through many challenges and he loves passing it on to another generation. 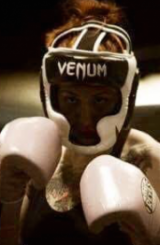 Elvis Gashi is one of the top aspiring professional Muay Thai fighters in the United States. Elvis moved to this country many years ago and took advantage of the opportunities it had to offer. He has an astonishing amateur Kickboxing/Muay Thai career with a record of 105 wins and only 3 losses. He is currently undefeated as a professional with a 17-0 record, 11 of those wins coming by way of knockout. Elvis teaches fundamental Muay Thai that is extremely effective and easy to learn. Elvis fights under the Vision Quest Muay Thai name, coached by our own Kru Primo. Coach Lou has been training Mixed Martial Arts for over a decade. He has trained in several forms, including Brazilian Jiu-Jitsu, Boxing, and Muay Thai. Lou has competed on numerous platforms, some of which include Brazilian Jiu Jitsu tournaments, Boxing, Muay Thai, and currently has fought in the cage 11 times. He currently holds a Purple Belt in Brazilian Jiu-Jitsu. Of the many forms Coach Lou has studied, Brazilian Jiu-Jitsu is by far his favorite for all the practical applications of that specific martial art. Lou has many years experience in the areas of strength and conditioning. He has been part of numerous success stories in the Super Woman Fitness Boot Camp program. However, his circuit-based classes are not limited to just women. Lou has learned and improved on conditioning for fighters of all disciplines. He aids in getting fighters ready for competition and monitors their progress closely. Lou’s expertise go even further than all of that! For many years, Lou has trained and developed a very successful children’s Mixed Martial Arts program. He has even taken his students on to numerous victories in the area of Brazilian Jiu-Jitsu tournaments. Anthony Fico was born in Mt. Vernon and Raised in Yonkers, NY. At the age of seven, he first tried out traditional Karate. When he turned 12, he took up Boxing under WBO Middleweight Champion Doug “The Cobra” DeWitt. 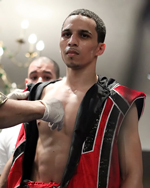 Eventually moving on to compete out of the Yonkers P.A.L., Anthony remained very active in numerous areas of martial arts. While wrestling in high school, Anthony took up Krav Maga and also had his first exposure to Brazilian Jiu-Jitsu. At the age of 17, he enlisted into the United States Marine Corps, where his exposure to hand-to-hand combat and self-defense flourished. He attained the rank of Sergeant in just four years and eventually parted ways to finished school. He graduated from Iona College with a BBA in Accounting and a MBA in Finance. Anthony has competed in Boxing, Muay Thai, and Brazilian Jiu-Jitsu. His area of expertise comes in dietary/nutritional coaching as well as strength & conditioning. His focus is to increase the natural mobility and flexibility of people while maintaining their focus on martial arts and fitness. Mike has been training in the martial arts since the age of six. His first passion was TaeKwonDo, in which he received his Black Belt at the age of 13. In high school, Mike found a new passion in fitness and weight lifting. Training for football and weight training went hand-in-hand and in his senior year, Michael was selected 1st Team All-State and awarded the golden-dozen for scholar athletes from the National Football Foundation. In college, Mike continued his training and love for fitness and received his CPT certificate. Soon lifting weights grew stale and he looked to get back into martial arts, thats when he started training MMA and never looked back. Winning in his first grappler’s quest at the 2008 US National Championship and in 2011 he competed in and won his first MMA fight. He has since entered the cage one more time and left victorious. In 2015, he fought and won the WKA Full-Rules Muay Thai National Championship. Mike is certified as a Level-1 Instructor with CrossFit, he is also a certified MMA Strength & Conditioning Coach under Kevin Kearns. Coach Kearns has served as the Strength & Conditioning Coach for professional Mixed Martial Arts (MMA) fighters including; Alberto Crane, Marcus Davis, Din Thomas, and Kenny Florian. Mike himself currently works with a handful of Professional Boxers and MMA fighters for their Strength & Conditioning, helping them reach and time their peak of physical fitness for fights. Kru Primo comes to Stamford Fight Club/C3 Athletics to share his love and passion for Muay Thai. He is a 7 time Muay Thai Champion! With over 50 Muay Thai and Boxing Matches under his belt Kru Primo has amassed a 14-1 professional record as a Thai Fighter, and a 3-0 Record in MMA Competition. New York City Lightweight Champion. He was a member of The USA Muay Thai Team during the IFMA World Championships in Thailand. He is a certified Kru with the USMTA and Fairtex under the late Alex Gong and is also the New York State Representative for the United States Muay Thai Association (USMTA). 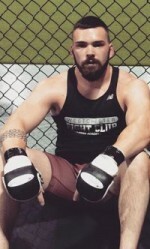 Primo was the head striking coach at Bombsquad MMA & Westchester Fight Club before joining us. At Bombsquad he trained fighters that have fought on the biggest stages of our sport. Including the UFC, Bellator, Bo-dog, King of Pancrase, and IVC. Samantha started Mixed Martial Arts at 15 years old. Samantha was overweight and nonathletic. Martial Arts was her first sport, inspiring a 100% commitment. Within her first year of training, Samantha had lost 70lbs and gone from a size 14 to a size 3. Once she saw what was possible, she knew that she wanted to help others achieve their goals. At 18, she fully dedicated herself to Muay Thai under Kru Primo. She sharpened her training and skills which led to her dominant success in all four events when she stepped into the ring. Samantha has been an MMA/Fitness consultant since 2010. Samantha has taught Kickboxing, Muay Thai, Superwoman Fitness, and Squat Squad; but maintains that her favorite thing to do is showing new members around and making sure they’re comfortable. According to Samantha, seeing people reach and then surpass their goals is the best part of her work. Marissa Givens has been a student and active Muay Thai practitioner for nearly 3 years. She holds a 10 year Martial Arts experience in many different styles such as Tae Kwon Do, Wing Chun, Shotokan Karate, Kyoshin Karate, Goju, Brazilian Ju Jitsu and now Muay Thai. Competing successfully in all but is still waiting for her official Mauy Thai debut. Along with her love of martial arts came a love of overall nutritional and physical health. From a young girl to her teenage years, Marissa has personally dealt with being overweight and the struggle of finding the right balance. From Fad diets to detoxes and all of the other things that just ‘didnt work'; Marissa was able to find the balance she was looking for with proper food education and determination, losing over 70lbs in the process within the first year. With her new found knowledge of proper nutrition and her experience of martial arts, Marissa aspires to fight very soon under Kru Primo. Holding 6 years of Massage Therapy practice and becoming an avid food enthusiast; Marissa helps to assist our students with overcoming the struggle of beginning a new lifestyle, as well educating students with ‘What’ they’re eating and it’s value to the body. Will is a Rye High School Graduate and currently a college student perusing a degree in History. From family of coaches, he has been around athletics since he was a child, and began his career in athletic performance at a young age. Will trained and interned at Parisi Speed School, Will was educated on injury prevention running mechanics and proper lifting techniques. Subsequently, Will spent several years as a strength and conditioning coach for New York’s top mixed martial arts gyms: training both amateur and professional fighters as well as teaching Boot Camps and Muay Thai classes. He was the head Strength & Conditioning coach for the Rye Garnets Athletic Program. His love for not only sports, but an individualized, scientific approach to training each athlete is the hallmark of Will’s coaching; it is a key to the success of his program and athletes. Jordan first explored martial arts in high school. At the age of 16, after seeing the first “Pirates of the Caribbean” movie, he begged his parents to enroll him in fencing, initially studying the foil. He soon after ditched foil and focused instead on the saber. He studied under Archil “Achiko” Iortkipanidze, and placed second in his first tournament, held at the Fencing academy of Westchester. At the age of 24, he went on to study Krav Maga in Austin, Texas under the Krav Maga World Wide discipline where he earned his second rank. This was also the first time he was exposed to Muay thai. 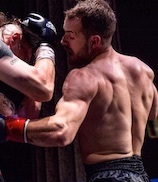 Jordy continued his Krav Maga studies after he relocated back to NY and eventually gravitated towards Muay Thai, dropping Krav Maga completely. In 2013, Jordy took up Arnis, studying privately under instructor William Daluyen. Due to his instructor moving back to the Philippines, Jordy continued his Filipino martial arts studies training in Kali with the Pikiti Tirsia Pit Bulls. 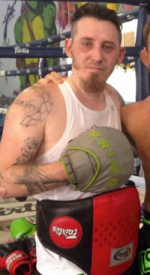 Jordy eventually left the Pikiti Tirsia Pit Bulls to join Westchester Fight Club to learn Muay Thai. Currently, Jordy is studying to be a personal trainer and enjoys , chess, Arachnology and Star Wars. Danielle joined the Fight Club family in January 2013 as a New Year’s resolution to lose weight and try something new. Despite growing up with Power Rangers and Ninja Turtles, Danielle did not have the opportunity to pursue martial arts until adulthood. Once she did, it didn’t take long for her to fall absolutely in love with Muay Thai; she not only lost over 60lbs while learning a new sport, but she found a new passion and a new family in the fight team. Danielle is an active member of Fight Team and looks to add more fights to her amateur record. You can find her on the mats both training and teaching Muay Thai.